A collaboration with Cheeky Monkey Tiny Houses, Penny and Strawberry’s big brother is our largest Tiny at 8.5’ wide by 28’ long and 13.5’ high. 357sq. feet plus a 75 sq. foot loft. The private main floor bed room fits a queen size bed and a closet or a one side access King with a closet. Plus room for a King sized bed in the loft. Comfortable stair and a full bath options. Bring the whole family Jude loves kids and dogs. Sleeps 6 comfortably . Or spread out by yourself or a couple. Cook full course meals in your full size kitchen. 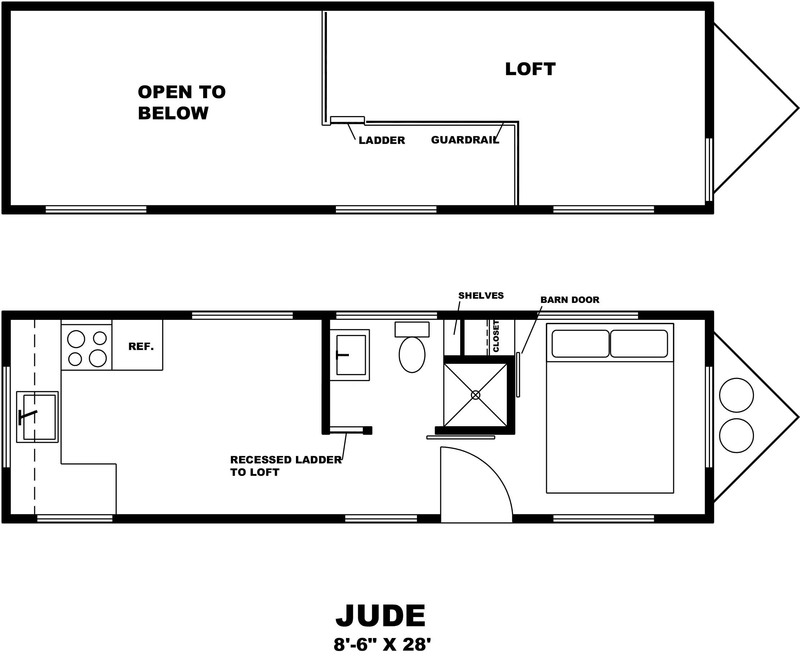 Even space for a dishwasher and W/D. Lots of light with 11 dual pane low E windows. With a large skylight in the loft option. Kick back on your love seat and snuggle up with your loved one or cat. Fridge – Apartment style fridge 9.9 cu.